We left Christchurch on the Trans Alpine Express, a daily rail service that links Christchurch on the east coast with Greymouth on the west coast. 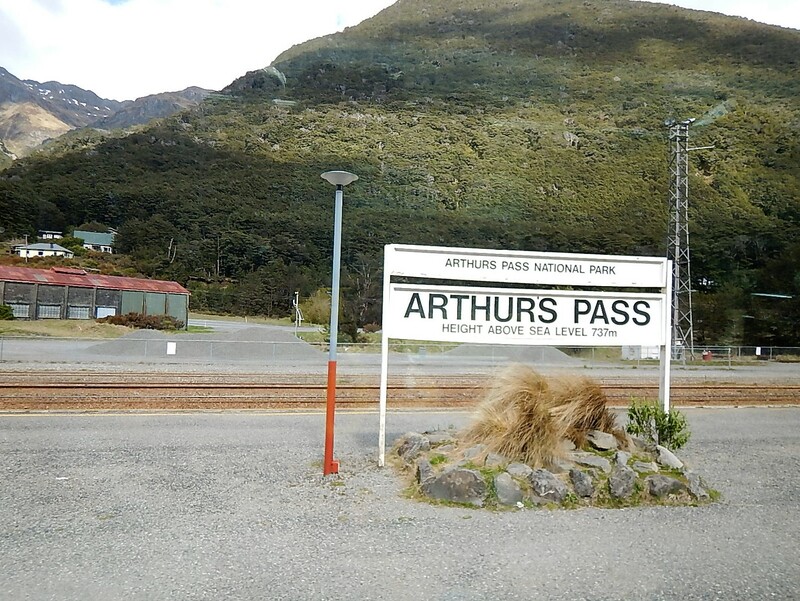 The route took us across the Canterbury Plains and then up over the Southern Alps via Arthurs Pass. The journey through the mountains was spectacular, we followed the course of two rivers (one of them called the Arnold River after a former head of Rugby School) crossing tall viaducts and passing through tunnels, one tunnel was over 8km long. In places we could see the track used by settlers and gold miners to cross the range in horse drawn carriages. As we started to descend from the pass we noticed that the river was flowing the other way, we had crossed the divide. When we left Christchurch the weather was perfect, clear blue skies, our luck held for most of the four and a half our journey but as we approached Greymouth it started to rain – welcome to the west coast!! We had lunch near the station, collected another hire car and headed south along the coast. Once again the journey was very scenic, the coast was quite rugged and the southern Alps rose alongside us. 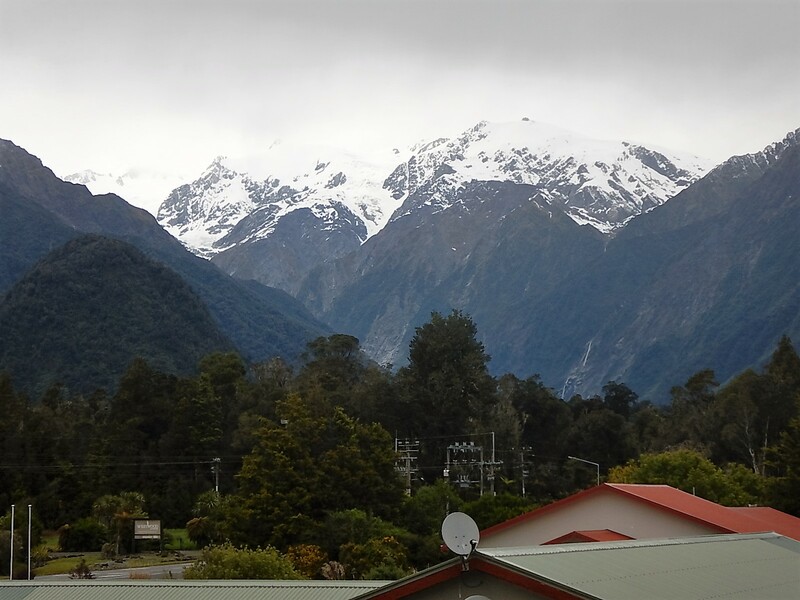 It took about two hours to reach our destination, Franz Josef, a small town named after the glacier just outside of town. We were welcomed to the Holly Homestead B&B by Bernie, our hostess, she made us very welcome, gave us tea (and beer for Mark) told us all about the activities and tours available locally and arranged for a local restaurant to send a car for us for dinner. What service! Then, to top it all she told us she had upgraded us to a suite so we had a private lounge adjoining our very comfortable bedroom. After she left us to settle in we found a jar of lovely homemade cookies, they were so good we got the recipe to bring home as a sort of virtual souvenir. For a small country town Franz Josef is blessed with some great restaurants, the first night we were there we went to an ‘eastern eating house’, I had a Thai green curry which was very nice, Mark was more adventurous and polished off a venison jalfrezi! Having discussed the activities available, and having seen lots of glaciers in Alaska, we decided not to visit Franz Josef, it has retreated quite a lot in the last five years so the only way to see it is via a very long, tough hike or by helicopter neither of which appealed. Instead we booked to go on a new tour offered by a small company in the next town, the tour is called Exposed (don’t worry, it was nothing shocking!) and promised to show us ‘the earths latest natural phenomenon’. A few years ago a small landslip by a local river exposed the Alpine Fault Line where the Australasian continental plate meets the Pacific Continental Plate, it is the clashing of these two plates that have formed the landscape in NZ, created the volcanic features we visited on the North Island and most recently caused the earthquakes. This is the only place in the world where a fault line is naturally exposed on the surface and ever since it was revealed this site has been the focus of international study by geologists and seismologist from across the world. For NZ$40 each how could we resist? We drove to Whataroa a reported to the tour office where we were met by Vicky and Grey, the couple who own the land adjoining the site of the fault (you can only get to it one way), they have set up the tours taking tourists, school kids, students and scientist out to view it. We were the only people who had booked the tour so we climbed on their all-terrain mini-bus and set off. About 5 minutes out of town Grey turned off the road onto a gravel track, from there we drove for about quarter of an hour across scrub land and over streams heading for the hills in the distance. Eventually we stopped and walked the last part of the journey. We came to the edge of a river called Gaunt Creek and crossed a rickety footbridge. Across on the other bank we could see what looked like a small quarry, right in the middle was a ridge of pale green clay, this soft sandy clay is formed by the friction of the two plates rubbing together and running through the end of this ridge was a small crack – the continental fault line. It was staggering, on one hand if Grey hadn’t pointed it out we probably wouldn’t have noticed it, on the other this is the feature that causes all the geological instability in the Pacific region. As we looked more closely at the rocks around us we could see that the strata on each side of the ridge ran in very different directions, the lines in the Australasian rock ran upwards as the plate rides above the Pacific plate, on the other side the strata were almost horizontal. Grey also explained that the friction between the two plates creates spoil which gets forced up the face of the plates and tumbles out of the fault causing a heap of gravel to form, geologists have proven that the gravel on the Pacific plate side of the site is actually from the Australian plate. It is hard to explain how amazing this unassuming site was to visit; it will certainly be one of our strongest memories from the trip. Back the Holly Homestead, as the rain settled in for the rest of the day we took advantage of our comfy private lounge and spent a couple of hours bringing the blog up to date (see previous entries on Kaikoura and Christchurch!). That night we shared a pizza in town and then prepared to move on again. I so want to visit this place, I so want the cookie recipe…….